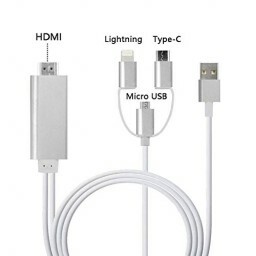 - 3 in1 Design HDMI Adapter Cables: Lighting/Micro USB/Type-C to HDMI cable supports mirroring of what is displayed on your mobile device screen to your HDMI-equipped TV, Monitor, projector. - Plug & Play: You don't have to fiddle around with settings, no need personal Hotspot / Airplay, WiFi connection or driver/Apps. Just insert each interface to devices and wait about 5-10 seconds, click "Trust" on your devices and they will automatically be connected. - Full 1080p HD Display: Support 1080P high digital signal output, can be connected to HDMI Monitors, HD-TVs, bring you high-definition visual enjoyment. - Apps Supported: The HDMI cable supports video callings from FaceTime, Skype, WhatsApp; videos, pictures, games, slideshows on Facebook, YouTube, Instagram, Twitter, IDMB, Microsoft Office, etc.Note that it does not suooprt Netflix, Amazon Prime videos, Hulu,Comcast tv, HBO go, Honda motor, Xfinity, Vudu, DIRECTV etc. - High Quality and Wide Compatibility: Adopts imported chip and oxygen-free copper core, enhance the transmission speed, reduce signal attenuation, ensure stable and superspeed transmission. 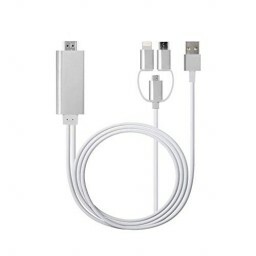 Lightning to HDMI cable compatible with Android 5.0 and IOS8 and above. Works with all the HDMI equipped TV, display, projector or other compatible displays. ★We stand behind our products 100% with 45 Days Money Back, One Year Guarantee and Friendly, Easy-to-reach Support.